OM: Pay your fine before February 6! 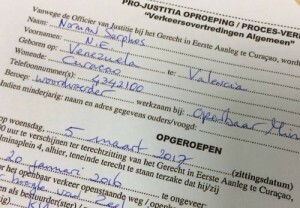 WILLEMSTAD - On February 7, 2018, a so-called "traffic session" in court will take place again. The Public Prosecution (OM) Curaçao reminds everyone that the amount as stated on the fine (OPV) is increased after the traffic session. Drivers can pay their fine during normal office hours at the office "Paga Bo But" at Waaigat, east of Curoil on Abraham Chumaceiro Boulevard. On Wednesday, 811 motorists must appear at the monthly traffic session. That is slightly less than normal.